Robe moving lights were at the hub of the show lighting for the recent Skol Sensation Party staged at Anhembi Parque in Sao Paolo. The hugely popular event, attended by over 50,000 dance music fans, enjoyed a stellar line up of DJs and megamix sessions from Mr White, Sunnery James, Ryan Marciano, Anderson Noise, Do Santos, Funkagenda, Michael Woods, Deniz Koyu, DBerrie and many more. Sao Paolo based LPL Professional (LPL) has been the official provider for the Brazilian Skol Sensation for five years. The main stage lighting production was a collaboration between LPL and the event’s two LDs, Summer and Pascal, who ran lighting and visuals on the night. The Brazilian version of the event which originated in Amsterdam and is staged worldwide, is known as one of the best and most sumptuous of these dance music extravaganzas, packed with beautiful people and superlative sounds. It’s also one of the largest such events in the country, both in terms of guest numbers and square metreage of space utilised. The theme for this year was ‘Innerspace’, a journey through the seven stages of enlightenment celebrating the ‘Now’, with guests required to follow the all-white dress-code, meaning that the audience became another lighting and projection surface for immersive visuals. 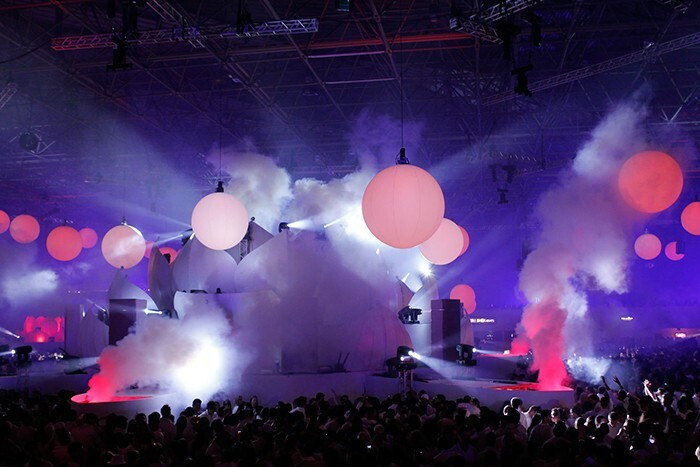 All areas of the event featured Robe fixtures, together with other lighting including generics and plenty of smoke and pyro effects. 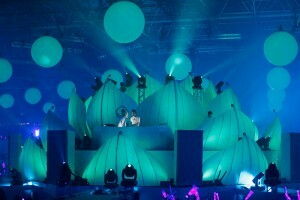 The main stage was 360º and built on four levels. Lighting included a total of 32 ROBIN MMX Spots, 18 ColorSpot 1200s and 18 ROBIN LEDWash 600s. There were also four smaller B-Stages, each lit with four Robe ColorSpot 1200E AT units. Ten trussing towers were dotted around the venue, all rigged with six ColorSpot 2500E ATs and four LEDWash 600s used to illuminate the dance floor. Last but not least, two alfresco areas were each lit with ten ColorWash 2500E ATs and four VIP areas with three Robin LEDWash 600s. On the main stage, LDs Summer and Pascal ran the lighting and visuals on two WholeHog4 consoles, one controlling the moving heads, the hydraulic stage system and the smoke effects and the other running the set LEDs, dimmed light sources and video. LPL’s LD and technical supervisor Erich Bertti comments: “Robe once again proved to be an incredibly sturdy and reliable choice of fixture. Daily we put them under serious pressure due to the workload and the constant stream of projects serviced by LPL. LDs really like working with Robe moving lights and are very happy with the overall performance”. In total, the event lighting consumed 25 universes of DMX control and featured over 300 rigging points.